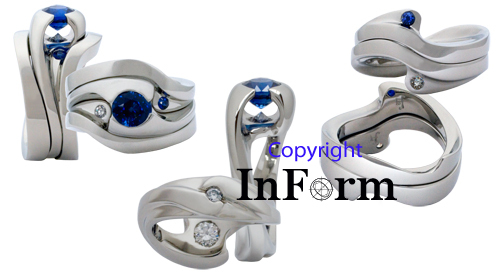 The picture seen on this page shows a white gold wedding set in which a 1.25 carat round sapphire has been set in a 14K white gold engagement ring. 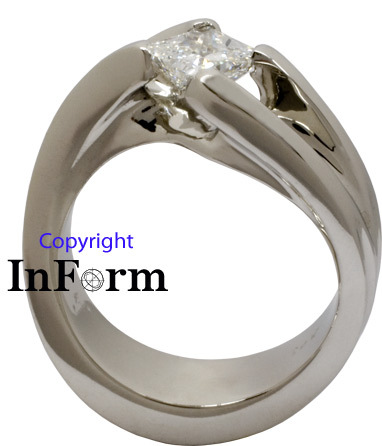 The ring exhibits a definite S-curve, providing an organic appearance. 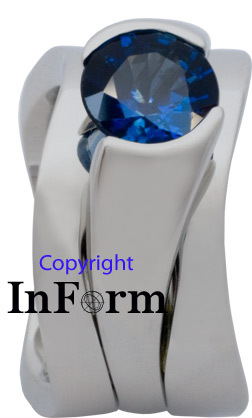 Immediately beneath the sapphire is an inverted diamond that's oriented in such a manner that the culet (the terminal point of the stone) nearly contacts the other. On the palm side of the ring, a small diamond has been channel set within the organic curves on the bottom side of the ring. After completing the engagement ring, the focus then came to making a pair of wedding bands that not only fit against the initial ring, but could alternatively be worn either on their own OR in combination with one another, again fitting very closely together. 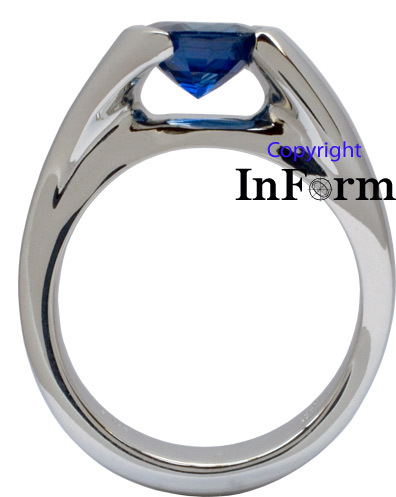 A small sapphire has been set in one of these rings and a diamond in the other, subtly referring back to the stones found in the engagement ring. 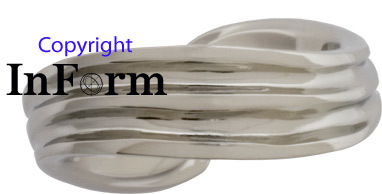 ***Please note that a ring of similar nature could be made of other colors of gold as well as platinum or palladium. When inquiring about this ring, please make reference to jlwdauset14 and provide a general idea regarding the desired ring size. The telephone number and tab to initiate an email are located at the top of the page. Or if you'd prefer to send an email from here, the address is farley@artwork-inform.com which you can click on to initiate an email.